Everyone wants to understand painting. Why don’t they try to understand the song of the birds? Have you heard the song of the red-winged blackbirds in this valley? What about those spirited hummingbirds, those flying jewels, tiny lightning bolts, dashing up, down, sideways and even backwards, coming to a sudden stop, hovering and looking at you, suspended in thin air, apparently motionless while their wings beat on average 60 times per second? These acrobats are a daily miracle in our lives. Since ancient times birds have inspired people and artists. Messengers of the gods, their flight or song were “signs” interpreted as either good or bad omens sent from a higher source. Had Caesar listened to the augurs about those Ides of March, he might not have walked into the Capitol that fated day in Rome. In cultures around the world, from the Greeks and the Egyptians to the Aztecs and the Zulus, these divine winged messengers were revered through art and rich myths. This is about two artists whose works I love, and the very different birds which inspired them. 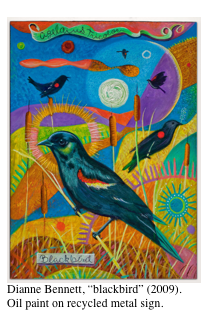 These â€œrare birdsâ€ are indeed treasures in our midst: two large paintings of magnificent, tropical birds by Jessie Arms Botke (on display at the Ojai Valley Museum) and two small retablos of modest, local birds by Dianne Bennett (at the Beatrice Wood Center for the Arts). The distinctive art and accomplished careers of Cornelis and Jessica Arms Botke have long been known far beyond Ventura County, where they lived and had their studio most of their lives. Originally from Chicago, the couple moved to Santa Paula in 1929. They worked together on numerous commissions (some grace public spaces in Santa Paula and Ventura), but had different styles, which they continued to develop separately. Cornelis (1887-1954) was a refined printmaker, a skilled draftsman keen on attention to details. 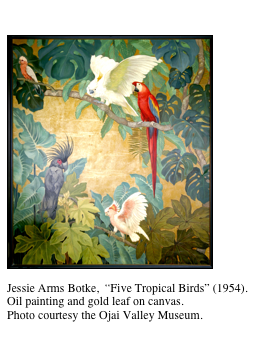 Jessie (1883-1971) became famous for painting exotic birds, with a predilection for white peacocks (the Botkes kept an aviary and peacocks roamed their large property in Wheeler Gorge). 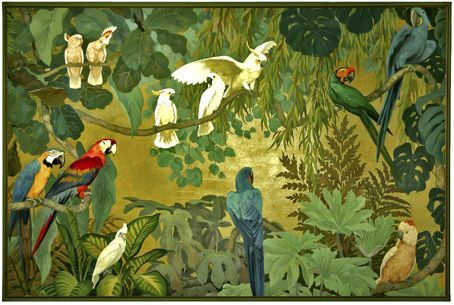 Her splendid skills as a designer and a colorist made her style famous: detailed renditions of elegant, rare birds set against luxuriant foliage in rich, dazzling colors with spectacular use of gold leaf backgrounds. She painted large and bold. Jessie’s works were widely exhibited and collected in Los Angeles, Chicago and New York. Her career was as brilliant as her painting. Jessie Arms Botke, “Twelve Tropical Birds” (1954). Oil painting and gold leaf on canvas. Photo courtesy the Ojai Valley Museum. Botke painted large-scale compositions of regal elegance, refined decorative canvases and murals often showing groups of birds in decidedly elegant repose. Her feathered subjects keep a certain distance from her and from the viewer: a splendid, seductive detachment. 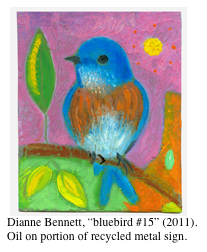 Dianne Bennett’s paintings of birds are often small to tiny in scale, and use metal signs and other rescued materials as support. Her focus is mostly on an individual subject and on more humble, common birds, but she is expressing their singular nature. These birds sit up close and intimate with the painter and the viewer. They speak to us in a direct, primitive, soulful language. Bennett’s works are currently exhibited in two local shows: “hear + now” at the Beatrice Wood Center for the Arts in Ojai (through June 29) and “one time one place” at the Museum of Ventura County in Ventura (June 9 to August 19).